Families travelling to the US are being urged by British Airways to get their children a passport or face delays. On Tuesday, new US State Department rules come into force requiring all UK travellers, including children, to have machine-readable passports. These passports feature two lines of coded data at the bottom of the photo page that can be swiped at check-in. Travellers who don't have a machine-readable passport will have to apply for a visa to enter the US. Under US law, travellers must present a machine-readable passport or a valid US visa before they can enter the country. 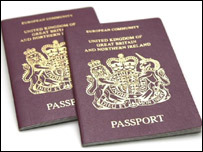 Machine-readable passports have been issued in Britain since November 1991, and holders can travel to the US without a visa for the 10-year lifetime of the document. Nevertheless, British Airways said that they were concerned that some travellers to the US could fall foul of the law change. "We are strongly recommending that all of our customers check their passports if they are flying to the US and make sure they either get the appropriate visa or machine-readable passport to make their journey stress free," said Jim Forster, British Airways spokesman. Failure to have a machine-readable passport or valid visa could lead to people being refused entry into the US. People who are refused entry due to having the wrong paperwork could claim compensation if they were not warned of the law changes by their tour operator in advance. However, if they have been warned, the tour operator is likely to disregard any compensation claim. Likewise, travel insurers will not cover any costs incurred by a traveller's failure to have valid entry documents. "We are not anticipating a huge problem with this, tour operators have been warning their clients for months of the US law changes," Sean Tipton, Association of British Travel Agents, spokesman told BBC News.